We need your old PCs! Over the Memorial day weekend I was trying to get groups together to build a mesh ad-hoc network at some of the big centers where Katrina victims were coming in. This was not feasible with all of the movement and confusion, but the fine folks at www.publicwebstations.com have come up with a Linux distro that boots from CDR and loads FireFox. Here is what you need to do. 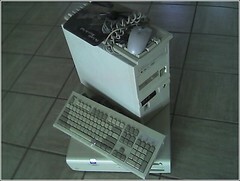 Go to your closet and grab that old P2 or AMD machine (or greater) with 128MB of RAM. Take out the hard drive and configure the BIOS to boot from CD-ROM. Burn the ISO from the above web site, plug your machine into a wired Ethernet jack and boot it up. You should see Firefox load and take you to a Red Cross welcome page. If that works then head to a shelter in your community and offer to install the systems that you bring. What are you waiting for? I know that you have an old computer in your closet! 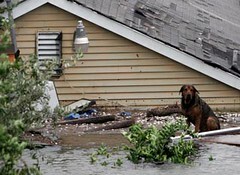 The animals are hurting with Katrina too. The traditional news media is giving little attention to the animal shelters in cities surrounding the states affected by Katrina. As of Labor Day weekened, they are OVER their capacity taking care of hungry, wet, dirty animals that often to not have collars. Please offer to donate your time or money at a local shelter or as a foster home to take care of these animals at your house. Most cats did not survive as they are not good swimmers; few made it out of homes and into trees. Many dogs were tied in their yards and perished in the rush of water. Those that were able to swim are missing patches of fur and have cuts from the debris. One of the few AP stories shows a grim look at the state of animals in the region. AP Story on Snowball and other pets with a more grim outlook. Please dontate your time or money NOW: Donate here!